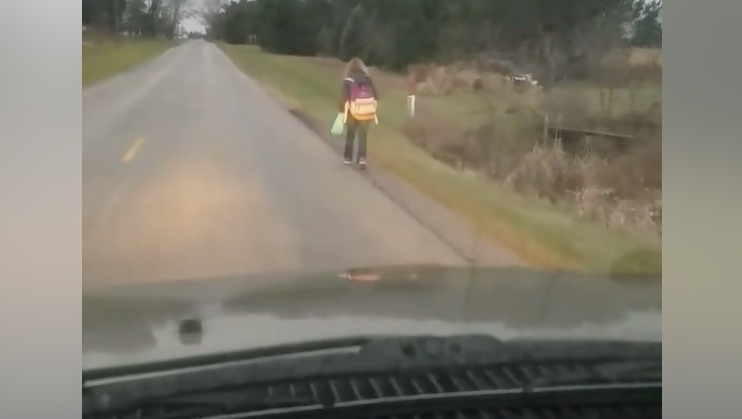 A father from Ohio posted a video on Facebook showing his daughter walking to school in the cold while he drives slowly behind her — and it sparked strong reactions from viewers. Matt Cox said he was making his 10-year-old walk to school because she bullied a fellow student on the school bus and he wanted to teach her a lesson. "So today my beautiful daughter is going to walk five miles to school in 36 degree weather," Cox said in the now-viral video. "I know a lot of you parents are not going to agree with this, but that is alright." In the video, Cox explains he is "doing what he feels is right" to teach his daughter a lesson about bullying. "For the second time this school year [she's] been kicked off this school bus due to bullying another student," Cox said. "Let me make this extremely clear: Bullying is unacceptable, especially in my household." Some parents praised Cox for his parenting tactic, with comments like "that's how discipline should be done." But others said his actions teach the wrong kind of lesson. "There are 1000 better ways to handle this situation that don't involve forcing a child to walk 5 miles in freezing temperatures," one critic wrote. Dad: "I'm going to bully you....to teach you that bullying is wrong!" In his viral post, Cox also said he hoped to teach his daughter a lesson on privilege. "Friday when my daughter brought home her paperwork for her school suspension she said, 'Daddy you're going have to take me to school next week.' A lot of children feel the things their parents do for them is a right and not a privileged – such as parents taking their children to school in the morning, or even bus rides to school in the morning." Cox's video has been watched 16 million times. He told any children watching to "please understand that bullying is unacceptable everywhere it will not be tolerated." He also added an update that the lesson had been learned and after having to walk to school, his daughter "seems to have a new outlook on bullying as well as a new appreciation for some of the simple things in life she used to take for granted."